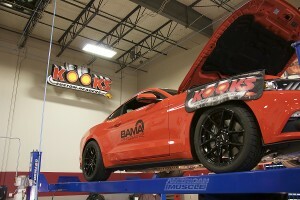 Bama Performance Adds More Power To Their 2015 EcoBoost Mustang! The Bama Performance Team has been unrelenting in their work with the 2015 Mustang and especially the EcoBoost, as evidenced by their last batch of mods. The Bama Team took a trip down to the Kooks Exhaust facility in North Carolina to add some 2015 Mustang Parts to their EcoBoost and to test them at the track. With an updated mod list, the EcoBeast was able to up its power and improve its performance. Previously it had put down 283 RWHP and 342 RWTQ. After adding the turbo back exhaust with the intercooler and B.O.V. the EcoBoost put down 308 RWHP and 379 RWTQ, which equates to an extra 25 HP and 37 TQ. With the addition of these new EcoBoost parts, the Bama Team set out to find a track to test these new mods. Even though they were only able to run at 1/8-mile track, there were some very illuminating results that came from shaking down the modded 2.3L turbo Mustang. 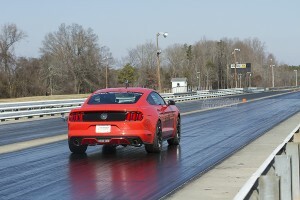 In stock form, the EcoBoost ran the 1/8-mile in 8.74 @ 79 MPH. As it sits now with the mods listed above, it went 7.71 @ 89 MPH, and impressive improvement over stock in the 1/8-mile; rqually impressive is the 60′ foot time of 1.59. Taking the 1/8-mile results and putting them into an online 1/4-mile calculator, it is expected that the EcoBoost will run a 12.0-12.1 @ 105 MPH in the 1/4-mile. The EcoBoost has returned from its journey down to North Carolina and is now waiting on more mods and more power, which consequently means more track time as well. The Bama Performance Team has some big plans in store for the EcoBoost and we will be sure to keep you up-to-date with the most recent news! 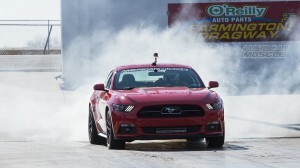 Next Entry Hot Lap: New Parts, The Latest Mustang News, and Cobra Jet Tuning! I’m excited about the “Prototype Intercooler and Up-Pipe Kit w/External Blow-Off Valve” they are using and when it’d be available to the rest of us to purchase from American Muscle. I don’t care for some of the other similar products already on the market.